This newly built eight-camera UHD flyaway/PPU is presented for sale in mint condition, having only been used for 10 weeks before the e-sports event it was covering was cancelled. Designed with e-sports coverage specifically in mind, the flyway is capable of handling eight UHD camera channels and 20 HD POV sources at the same time. This allows you to set up POV cameras on gaming stations while covering a range of studio shots with the UHD channels. Cameras in the shape of eight Panasonic AK-UC3000GSJ UHD complete camera channels and 20 Marshall CV-565-MGB HD POV cameras are included. Canon HJ11 and HJ21 lenses for the channels are also offered, along with all cabling required. The PPU’s production capabilities are built on Grass Valley technology. 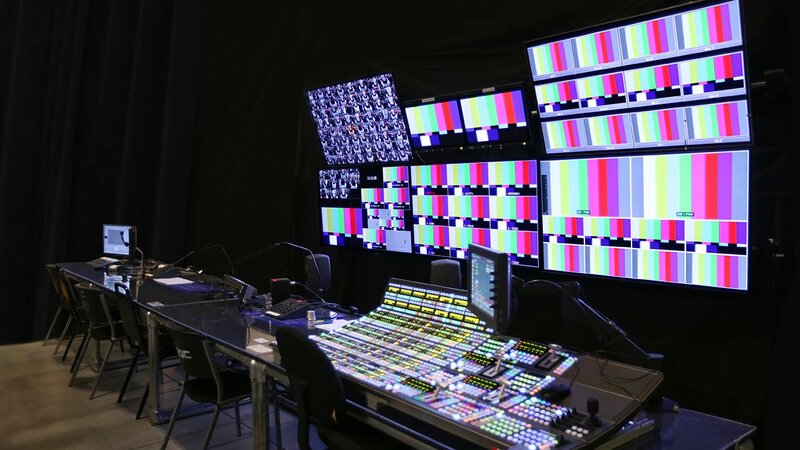 A Grass Valley Kayenne K-Frame vision mixer offers 96 inputs and 48 outputs and 4 ME as standard, but this capacity is significantly boosted by a series of option modules. Full details are in the Production section of the specifications listed below. Graphics are powered by a Ross Xpressions Live CG and graphics package. Underpinning the PPU’s 4K functionality is a Utah Scientific UTAH-400 Series 2 3G SDI matrix router. Its 192 x 192 standard in/outputs are boosted by a plug-in expansion unit which increases the router’s capacity to 288 inputs x 288 outputs. Audio hardware is not included in the package. Fully Loaded package includes creation and playout software. 1x DataLinQ Server Option. Provides connection to external data sources such as ODBC, RSS, Excel, Access, and XML. 1x Xpression Custom Keyboard. Dedicated Keys for Xpression Functions. User Defined Custom keys. 1x UTAH-400/288R Series 2 frame loaded with 192 inputs and 192 outputs. 3G HD/SDI video. Includes dual power supplies. 1x SC-400E control system with redundant control cards and power supplies. 1x User-configurable control and status panel. Features 16 LCD re-legendable /programmable user buttons. 1x 64-button control and status panel. All button are programmable for source, destination and/or level selection. Features up to 72 (w/”shift” function ) source buttons. E-NET interface.